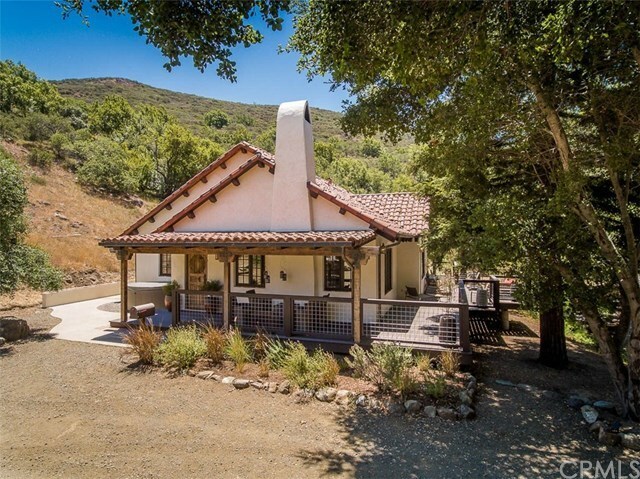 This one-of-a-kind legacy property sits nestled in the quiet and stunning rolling hills of San Luis Obispo. Large heritage oaks and the year-round sounds of Stenner Creek set the scene for this 5 acre refuge. With two impressively constructed residences, and an agricultural zoning classification, the options for this property are endless. Both the main and secondary homes are tastefully designed with timeless traditional architecture. The original designerâs understanding of true Spanish detailing is evident at every turn as you move throughout the spaces with vaulted wood ceilings, Saltillo tile floors, hand painted tiles, beautiful stonework and high-end fixtures and finishes throughout. Complete with Viking, Sub-Zero and Liebherr appliances, Pella aluminum windows, skylights, fireplaces and a private well. The main house consists of 4 bedrooms, an office, 3 baths, and open living space. The fully furnished secondary house currently operates as a highly desirable licensed vacation rental. This 2 bedroom, 2 bath dwelling adjoins a spacious 1800 sqft shop with additional bunk room and large bathroom, offering a great opportunity for passive income that doesnât impede your serenity. While privately situated, its location still places you close to the beaches and provides direct access to hiking and biking trails right outside your door. Located 1 mile from Cal Poly and 3 miles from downtown this is the perfect balance of rural and city life, making this property truly unique. Selling Office: The Avenue Central Coast Realty, Inc.